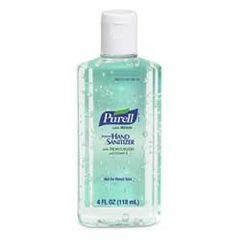 Purell Hand Sanitizer with Aloe is America's #1 instant hand sanitizer. Kills 99.99% of most common germs that may cause illness. Works in as little as 15 seconds. No water or towels needed. Contains aloe and specially formulated with moisturizers that leave hands feeling soft and refreshed without stickiness or residue. Helps reduce the risk of healthcare acquired infections; can be used to supplement handwashing and when soap and water are not readily available. Dries quickly with no sticky residue. Leaves hands feeling soft and refreshed. Reduces skin irritation caused by frequent washing and gloving. Helps meet OSHA Bloodborne Pathogens Standard designed to protect against health hazards related to occupational exposure to body fluids, bloodborne pathogens, and other potentially infectious materials. Contains 62% ethyl alcohol and moisturizers. CHG and latex. I felt for the size its was to too pricey. Hard to find size thats great for the gym! by Gato Feeder from Cypress, Ca. Plain alcohol sanitizer dries up my hands. Purell with Aloe keeps them smooth even with repeated applications throughout the day. Good, but, lacks pump applicator!